Reader Parrish E. admitted to tooting his own horn by sending this tip to us, but we'll allow it, because his life-size construction of Claptrap—with a functioning headlamp, mind you—is straight up awesome, and the best part, it's a gift for a friend. Parrish and his wife were introduced to Borderlands by a friend shortly before Borderlands 2 released in September. And then, of course, they played the sequel. "Our friend expressed an interest in building the super intricate paper craft model that came out a while ago," he says on the Gearbox forums. "She's pretty busy with school and work and the like, so I figured I'd build it in my spare time (currently unemployed, and job hunting only occupies so many hours in the day) as kind of a thank you for introducing us to the series. "And then I realized I don't have anywhere near the patience for that many little pieces and gluing everything together, and even if I did manage to build it, it's pretty fragile," he said. "I know my way around a table saw, however, so I decided to build a large, almost full scale model. I could never really nail down his exact dimensions, so I went off the 4" figurine, and scaled that up to what pre-made wheel sizes were available to me." 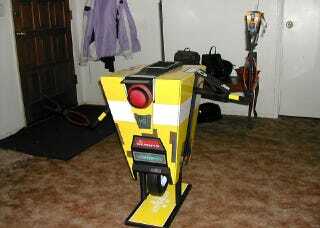 Voila, you now have a full-size Claptrap. Brandishing what appears to be the figurine Parrish referenced. It took about a month to assemble, and he just uploaded the finished pictures yesterday. The rest of the forum thread shows Claptrap throughout the stages of his construction, with the requisite slow-claps and compliments from the Borderlands community.